"Smidget is a very special horse." From the title, you may suspect that this is a book about a horse. And so it is: a 21-inch high, 80-pound mare named Smidget, to be exact. She travels the USA performing tricks. Or at least she used to. Shes probably dead now. But this book strives to be about so much more than just a horse. You see, almond farmer Ron Boeger had a dream: to find the worlds smallest horse, buy it, and appear with it on The Merv Griffin Show. Through much hard work and dedication, his dream came true. Sure, Ron, thats all fine and good. But we really came here for the freakshow. We want to see the little freak horse with a fake saddle and a Cabbage Patch doll on her back! Now thats more like it!! Actually, the books chock full of photos that emphasize Smidgets unusual stature. Shes shown posing with, among other things; a normal-sized horse, a duck, a silver dollar, and Wilt Chamberlain. Sigh. Where are they now? I found your site when, out of idle curiosity, I Googled "Smidget"... I used to travel with this horse as her "trainer" in the summer of 1984. I was nineteen and had been working at county fairs in California and Arizona with a food vendor, and met the owners of this horse and started dating one of their employees. When my current job ended, they offered me a position taking care of Smidget and I traveled with them for several months, learning her tricks and making appearances with her, keeping her company and exercising her twice a day. She was a truly special creature, extraordinarily intelligent, with a sweet nature. I felt badly that they used her for financial gain, but she was treated well and never seemed unhappy except when the crowds that used to pay $1.00 to see her in her special trailer at the fairs would want to pet her too much, in which case I would step in and protect her. 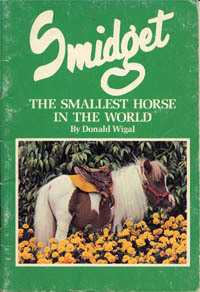 The dating relationship ended badly and I ended the working relationship shortly after that, but it's always been fun to be able to say that I was once the trainer of the "World's Smallest Horse"... When I've been to fairs since then, the "Smallest Horse" exhibits never have compared to my sweet little Smidget. Last summer I was at our local fair and ran into the family that owned Smidget; they also had a pony ride that they took to fairs in addition to Smidget, and the boys who were kids when I worked for the family were running the pony ride and vaguely remembered me. Sadly, they told me that Smidget died in 1990. Thanks helping us know Smidget a little better, Alexis. And Smidget, rest in peace. May you be hot-tubbing in that great pinto-painted limo in the sky right now.